Eleanor Trio Powder Eye Shadow is a new generation of eye shadows that smooth and perfect the eyelids while offering unprecedented comfort, color and adherence. They smooth and brighten delicate eyelids with a veil of pure color. Light, yet creamy to the touch, this performing powder offers optimal adherence. Enriched with actives to preserve skin elasticity this powder keeps the lids soft and comfortable. Excellent pick up and pay off for easy, quick and perfect application. 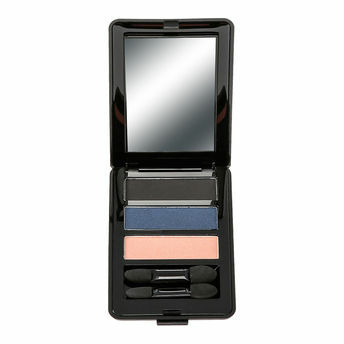 Color blends evenly and flawlessly on the eyelid with an adjustable, luminous finish. Gives your skin a smooth, silky texture that is free of flaws and imperfections. The color blends evenly and flawlessly on the eyelid with an adjustable, luminous finish. Includes 2 Sponge tips for superior pick up and color pay off. Explore the entire range of Eye Shadow available on Nykaa. Shop more Eleanor products here.You can browse through the complete world of Eleanor Eye Shadow .Alternatively, you can also find many more products from the Eleanor Trio Powder Eye Shadow range.